I did some exploring into just who put out the DrawMixPaint videos that I’ve been watching. Interestingly there’s no self promotion in any of the them. I went to the website to find the artist’s name, and then had to google to find out more. Turns out my instincts were good – this artist, Mark Carder will be known to many of you. I’ll let you do your own googling. But when I have a link page, he’ll be right at the top. I spent this week building the shadow box he suggests, plus the box for the lamp that goes on top. I had to modify it to sit on my tape cutting table (which happens to be exactly the 36″ he recommends for my height). I also had to do a major clean up of my tiny studio. 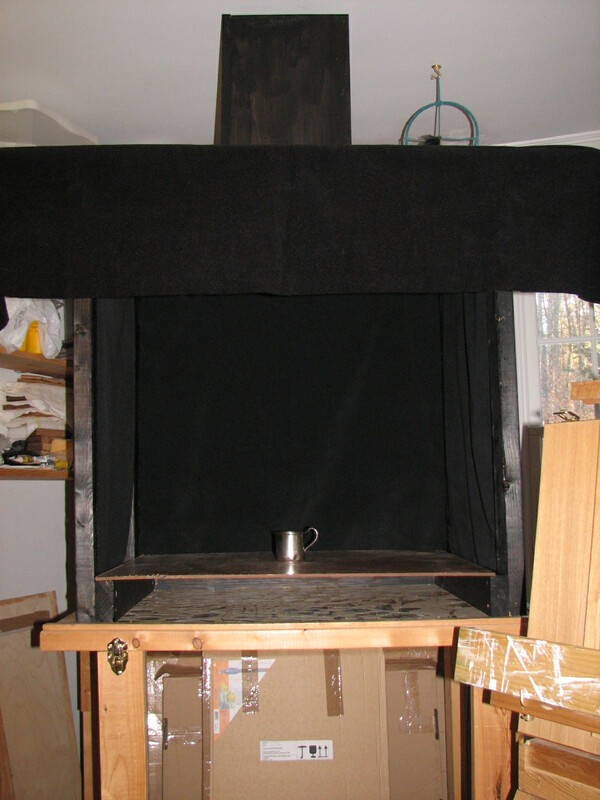 I removed all my saw making equipment and materials which gave me enough room to create the proper placement of the still-life box and easel, plus overhead light. I’m waiting for my 5000k bulbs to arrive, at which point I will wire my lamp box and attach the other to the overhead position on my ceiling. Meanwhile I’ll make my paint checker and holder, and a proportional gizmo – all from the free DrawMixPaint videos. I also need to do some scavenging to find interesting platforms for my still life. In the photo you can see I just plunked my silver baby cup in there on the base that I placed where the platform for the still life I will paint will go. In the painting video mentioned in the earlier blog is of a similar cup. So this might just be my first use of the box. My workroom is only 8′ high, so it’s all a little close. I’ll have to figure out a clever way to cover the windows and still allow ventilation. 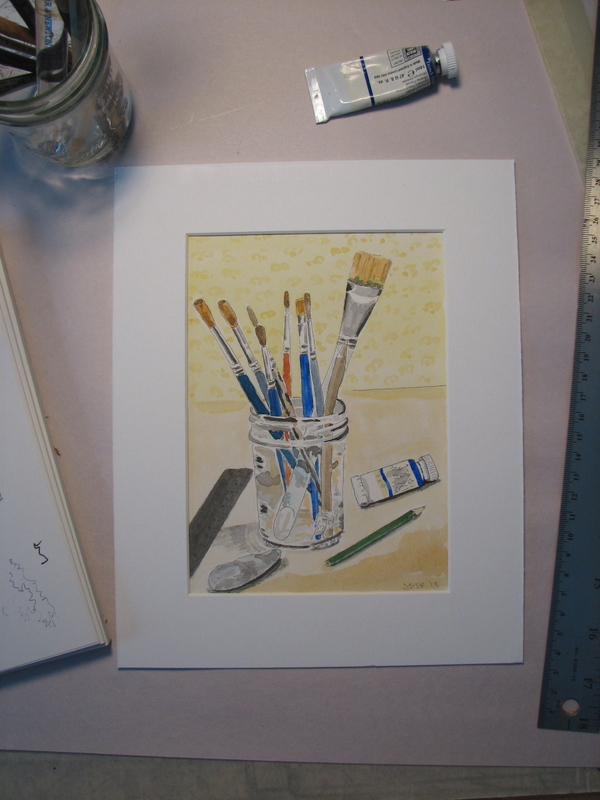 Otherwise I’ll be found unconscious at my easel some day – if I’m lucky. So other than painting the light box [does this count? ], I’ve done no other painting this week. But to carry on bringing this blog to present day, after the tape painting, I procrastinated a little more with a pen and ink, watercolor, sketch. Here it is. You can see the pencil sketch in the header for this blog. Categories: Artwork, Painting, Watercolor | Tags: 5000k bulbs for painting, Carder light box, Carder method, DrawMixPaint, Mark Carder | Permalink.